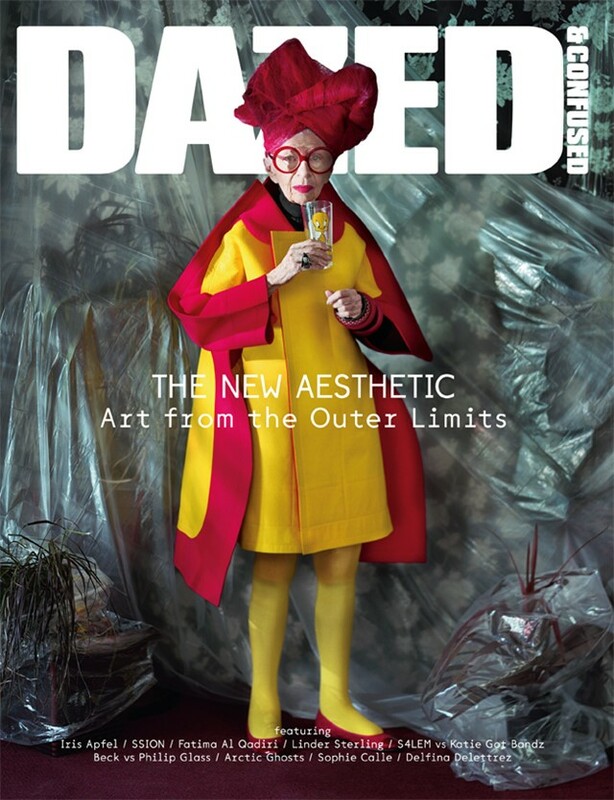 Iris Apfel is on the cover of our new art special, out now. The 91-year-old New Yorker dressed the rooms of nine Presidents, played mother, grandmother and great-grandmother to successive generations of designers and advanced the cause of dressing-as-art more than almost anyone else alive. Shot by Jeff Bark at Apfel's home in Manhattan and styled by Robbie Spencer in Rei Kawakubo’s 2D Comme Des Garcons collection, it's a perfect snap of her zen-meets-baroque style, and of this unique woman. You can watch an incredible film from the shoot above, and pick the mag up from shops everywhere. Alongside an illuminating, inspiring interview with Apfel by Karley Sciortino is the scoop on Fatima Al-Qadiri's jaw-droppingly new record and her work with Gulf futurist and video artist Sophia Al-Maria, the story of how glam SSION went from unlisenable oik to high pop punk and a chat between Philip Glass and Beck on their friendship, their collaborative remix project and appreciation of the skeletal structure of musical scores. Rounding up our issue on art's outer edge is Francesca Gavin's identification of the Off Modernists – young artists creating radical reworkings of history – alongside six orginal commissions from this thrilling breed. When our editor Tim Noakes told teen-blog phenomenon Tavi Gevinson about this month’s cover, she emailed to say “If I’m ever disappointed about anything, just thinking about Iris makes me feel inspired again. Her existence has changed the way people think about fashion, and about themselves in the meantime. I hope to be like her ASAP, not just once I’m her age.” Iris herself famously once said "When you don't dress like everybody else, you don't have to think like everybody else." We're in full agreement, and hope you are too. Clarification: the original copy suggested Fatima Al-Qadiri coined the term Gulf futurism. This is incorrect – the idea was Sophia Al-Maria's, and the copy has been changed to reflect.